The epitome of cat patterning and design, the tabby is the closest that the domestic cat comes to its pre-domestic forebears. The tabby gene is a dominant type, and the new-born kittens of other breeds often have faint, transient, tabby markings that bear witness to their untamed cousins to have effective camouflage in the wild. Despite the “pushiness” of the tabby gene, however, the exacting demands of the breed standard have ensured that the pedigree Tabby is no common or garden, run-of-the mill cat! Tabby cats appear on the murals of Pharaonic Egypt, and they have been depicted by artisans and artists ever since. Indeed, the name comes from Attabiya, a quarter of old Baghdad in which a striped cloth was made, known in Britain as tabbi silk. The modern, pedigree, version of this venerable cat originated from crossing the best of British street cats during the nineteenth century. The British Tabby Shorthair is a good-natured, affectionate, and intelligent cat that makes the best sort of friend. The British Tabby Shorthair is bred in two coat patterns, and in several colors. The Mackerel is the more striped cat and lacks the spirals of the Classic. Brown, Silver, and Red are recognized colors in both Britain and the US, with the latter recognizing Blue and Cream as well. A Classic Tabby should have a butterfly shaped on the shoulders, from which three stripes run along the spine, an ouster-shaped spiral on each flank, and narrow necklace-like stripes across the chest. The abdomen is spotted and the forehead should have frown marks that form a letter “M”. Both the tail and legs should be evenly ringed. The fur should be short and plush. The deep red markings should correspond to the classic tabby pattern, and be set against a rich red ground color. - Ground color and markings should be evenly balanced. - Markings on each side of the cat should be identical. - Short but well proportioned. - Legs ringed with “bracelets”. The paws are large and round with deep red paw pads. - Round and broad, with a short, straight nose and a well-developed chin. - Tabby “pencillings” on cheeks. Large and round; copper, gold or orange in color. British Red Classic Tabby Shorthair. A pedigree Red Tabby Shorthair may bear a superficial resemblance to the neighborhood ginger tom, but its rich red coat and distinctive dark red markings put it streets ahead. The correct color combination of a rich or coppery brown with dense black markings is difficult to produce, making Brown Tabbies relatively uncommon. 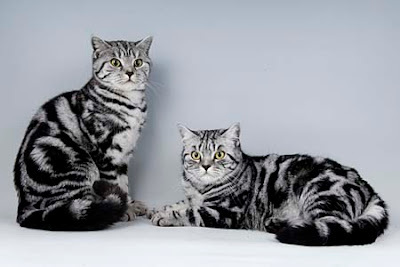 Probably the most popular variety of Tabby, the Silver is also said to be the most friendly. It should have sharply defined, dense, jet-black markings that stand out against the silvery-grey ground color. The nose pad is either brick-red or black and the eye color should be green or hazel in Britain and gold, orange or hazel in the US.